On FEb 5, 2019, the "Aidanova", enroute from Funchal to Tenerife, requested the evacuation of a 76-year-old Norwegian passenger with a heart attack. Salvamento Marítimo deployed the helicopter Helimer 2020 along with two doctors. The patient was hoisted and taken to Tenerife North, where an ambulance was waiting to take him to hospital. 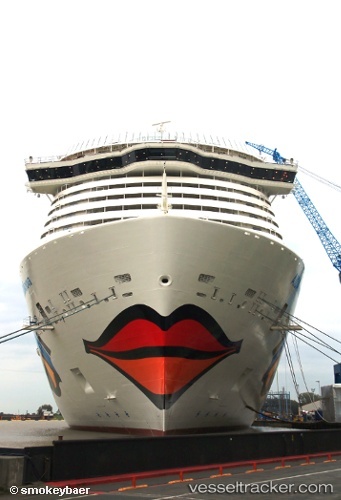 Carnival Corporation brand AIDA Cruises took delivery of its newest ship, AIDAnova from Meyer Werft shipyard on 12 December. The vessel, which is the world’s first to be powered by LNG at sea and in port, has since set sail for Santa Cruz de Tenerife in the Canary Islands, where she will pick up guests for her inaugural seven-day cruise on 19 December. AIDAnova is the largest cruise ship to ever have been built in Germany and was christened at Meyer Werft’s shipyard in August, Onboard highlights include a domed adventure deck with three water slides and a climbing garden, a theatre with a 360-degree stage and more than 20 different stateroom types and 40 different restaurants and bars, including seafood restaurant Ocean’s and the Teppanyaki Asia Grill.